Electrics make life more fun. What's not to smile about with almost free fuel, very little servicing and no emissions! At around R0.05 per km for fuel you'll be smiling every day. No need worry about petrol prices any more, just plug in anywhere, at home, at work, a cafe or a friends. It only cost a few of rands to charge your electric so look forward to keeping more money in your pocket. In some ways electrics are safer than petrol bikes because they don't make noise and so you can hear everything around you. Why make life more complicated, more expensive and less fun, when it doesn’t have to be! Here’s why you’ll find yourself smiling more while you EWIZZ around on your electric scooter. EWIZZ electric scooters have great perfomance, no vibration and no gears. Powers ranges from 100cc to 350cc equivalents and that power is available all the time with the flatter torque curves of our electric hub motors. The top speed on an EWIZZ electric scooter is also a speed you can drive continuously at. This is because EWIZZ electric scooters do not have the same reciprocating components and forces as an internal combustion engine. So it does not stress the motor in the same way at higher speeds. EWIZZ electric scooters save you money. They don’t use petrol and cost virtually nothing in fuel at approximately 5c a km and equivalent efficiency of 360 km/l. For the price of 1 months fuel for your car you can ride an EWIZZ electric scooter for nearly 3 years! Electric scooters need very little servicing. The only moving part in the drive train is the rear wheel. There’s no internal combustion engine, gearbox, belt or chain. This means there is very little to wear out and service intervals are much longer. 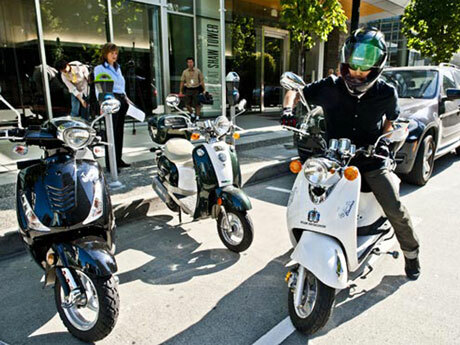 The latest zero emission technology means that instead of petrol, EWIZZ electric scooters use electricity to power them. So, rather than having to go to out of your way to a gas station and pay increasingly exorbitant amounts for ‘filling your tank’ you now just plug-in and ‘charge’ your EWIZZ electric scooter conveniently at home with any normal household plug point. As the power draw for charging is low, extension leads work really well to reach points that are further away and you can carry them with you under the seat if you need! Simple, easy and inexpensive. EWIZZ electric scooters can travel between 40 to 250 km on a charge, depending on the model and how you ride. Choosing the right mix of size, power and range is important and we’ll help you get the right EWIZZ for you. Being able to plug-in to any normal 3 pin plug point means you don’t need to install special charging infrastructure and anywhere you find a plug point you can charge. Because there’s no engine, there’s no noise, vibration or smoke. Smooth, quiet electric scooters are much less stressful to ride and for safety you can now hear everything around you. Electric scooters don’t have an exhaust so there’s no chance of burning yourself on it and because this is clean technology electrics don’t leave a trail of pollution emissions behind you. EWIZZ electric scooter store electrical energy in high tech Lithium batteries and they use this to power zero emission & highly efficient electric motors. Riding electric scooters is super cool, saves you money, saves you time and saves our environment. Welcome to the future of transport. Get ahead, Get electric. The savings with riding electric are huge! In money, time and environmentally. 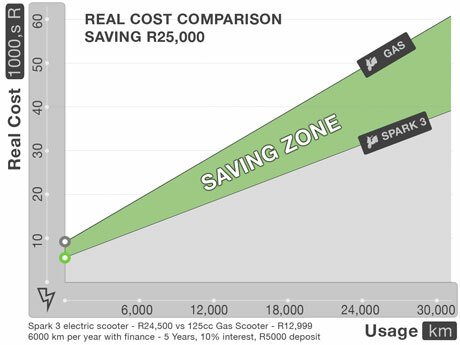 As an example, if you are doing 6000 km a year on a Spark 3 you would pay a lot less on average every month and could save around R5,000 a year. That’s R25,000 in 5 years back in your pocket. Check out our article Electric scooters cost you much less than gas scooters for an explanation of the reasons why electrics are so much cheaper. How come I save so much? The concept is actually very simple. 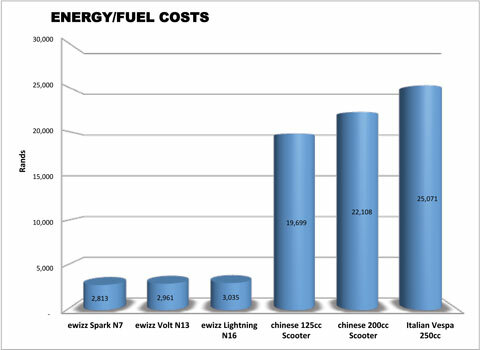 Electric scooters may be more expensive to buy outright, but the servicing, fuel and depreciation costs of gas (petrol) scooters make them much more expensive to own. Electrics usually work out around 50% to 75% less for the real per km cost. The low purchase price of a gas scooter is just a way to sucker you in…. Just like with a cell phone, the real cost is coming later…. Overall gas scooters can end up costing you around twice as much as an electric scooter. There is very little servicing on an electric scooter and it doesn’t need doing very often (every 10,000 km). The only main moving parts in the power production and drive train are the wheels, there are no belts, chains, pistons or gears to wear out and no filters, spark plugs or oils to change and no valves or clutches to adjust. Less servicing means less cost, less trips to the garage and more time on the road. Electric scooters do have batteries that eventually wear out, but with our latest Lithium ion batteries there are fleet examples of these bikes doing over 50,000 km a year and still going strong. From lab battery testing we expect to get over 100,000 km from one set, that is why we warrantee the Lithium ion batteries for 3 years or 50,000 km’s (whichever is reached first). The drastically reduced running costs and better residual values simply means electric scooters cost you much less. So don’t be put off with the higher purchase price. The real financial hit with petrol scooters comes later in all that servicing, fuel and depreciation. The electrics also produce only half the emissions of the gas bikes (this is because of the way Eskom generates most of our power with coal) so the electric scooters are much better for our environment and if you can charge off solar then you are completely zero emission. Electrics are better for your pocket, better for our environment and better for our health. Basically, they are just better. For more information and the detail behind these comparisons just contact us here. Care of the environment is an important consideration for us all. ewizz electric vehicles are zero emission, clean & energy efficient technology and running an electric vehicle is driving a cleaner and healthier future for us all. Although electric vehicles are zero emission technology that doesn’t mean there are not emission from using them. This is because of the way we generate the energy to fill the batteries. If most of the power generation is via dirty sources, such as coal, then emissions are created, but this is still much less than gas (petrol) vehicles. As we move our centralised and local power generation to cleaner, and renewable, technologies then these vehicles automatically get cleaner too. So we can get there with electrics in a way gas vehicles never will. 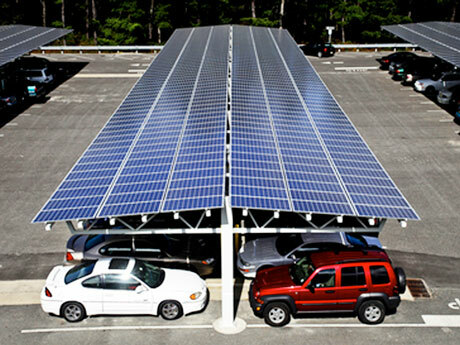 Electric vehicles can be recharged from solar power, for example with local solar recharging systems tied into a buildings power network. This means that what the solar array produces offsets the building and vehicle charging needs, but there is always power available, via the grid, to power the building and charge the vehicles when the solar array is not delivering power. Whatever the solar panel array produces is an emissions offset. 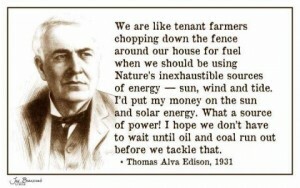 Solar energy is getting cheaper not more expensive to produce, imagine energy prices going down and not being so reliant on central production, that is the future with solar energy. This is happening all over the world. For an example just take a look at what is happening in Germany! Oil, on the other hand, is getting more and more expensive as demand increases, extraction costs increase and supply diminishes. The reason electric vehicles are such a good choice is because they are much more efficient than gas (Petrol) vehicles, for the majority of our usage they are around 10 times more efficient on average. EWIZZ electric scooters and electric motorcycles have an equivalent efficiency of 360 km/litre. This is because they are not wasting large amounts of energy in heat and noise. Gearboxes & internal combustion engines have significant energy losses and generate a lot of heat. Water cooling and radiators are specifically designed to waste that heat energy. This is all energy from the fuel that you have paid for but is being wasted because of the inefficiency of gas vehicle technology. Electric vehicles also have the opportunity for energy saving and recapture technologies such as regenerative braking systems (REGEN) like the KERS system in Formula 1 motor racing. EWIZZ electric scooters are much more efficient at lower speed, especially in town driving, whereas petrol scooters only become relatively efficient at a higher speed. This is partly because they waste a lot of energy in braking and in heat and friction when sitting in traffic. For example a Volt 6 F electric motorbike driven at 50-60 km/h with an 85 kg rider can achieve 155 km on one charge with a mix of flat and hill riding. At that speed the electric scooter would use 7% of the fuel, of the gas scooter, and be 14 times more efficient. Fuel – ewizz electrics don’t use gas (petrol) or diesel. So no more smoke or emissions coming out of the back of your vehicle. This leads to reduced local smog and pollution which is better for our health. Also, we don’t have all the environmental issues associated with the fuel excavation, production and transportation. Oils – Our electric scooters and motorbikes don’t have an internal combustion engine, gearbox or differential oils. They need almost no oils or grease except a little for lubrication of the brakes, bearings etc. Almost nothing in comparison. Filters – There are no air or fuel filters to replace. Gears – Our electric scooters and motorbikes don’t need a gearbox or gears. This reduces weight, servicing and increases efficiency. 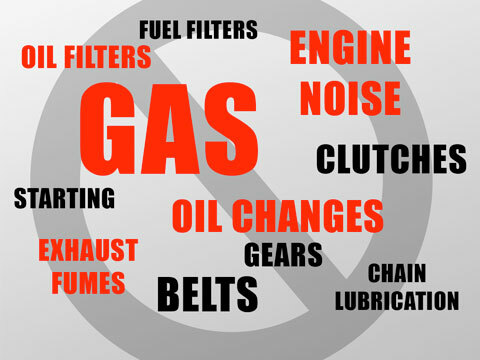 Belts, Chains, Sprockets – Nope don’t need these either, thus saving energy, servicing and oils. Brakes – The brake pads last much longer because with the electric you now use regenerative braking to slow down most of the time. So instead of is every 6000 km it’s 10,000 km. Exhausts – Electrics don’t have these, so zero emissions coming from your vehicle now and no chance of burning yourself on it! Radiators – Only small amounts of heat are produced by the electric motors and controllers so there is no need for large cooling systems. Only some of the higher power scooters and motorbikes have small water cooling systems with antifreeze. Starter motors – Electrics don’t need these. So there is less to wear out and no need to worry about starting issues. Spark plugs – Don’t need these! Clutches – There are no gears, gearboxes or clutches. So no clutch plates or belts to wear out and change. With ewizz electric scooters the rear wheel is the motor and this is brushless which means nothing wears out. They just works on magnetism, magic! That’s ewizz clean technology… saving money, time and our environment. Nearly all of the materials in the electric scooters are reusable or recyclable. Where we can reuse or recycle we do. Below is a list of some of the areas where we can do this. Lead acid Batteries – These are pretty much completely recyclable locally. 96% of the materials can be reused. LiFeYPO4 Batteries – These are not recyclable here yet but are recyclable, and are being recycled in Europe. However, shipping them there doesn’t make environmental sense. 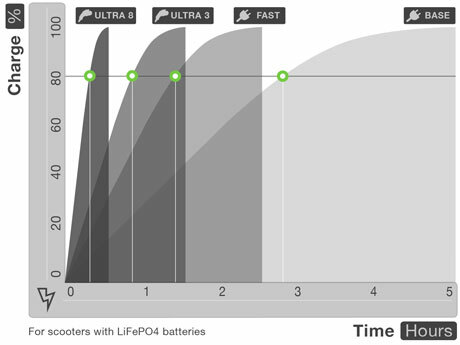 However there is good news, our LiFeYPO4 batteries will last a long time. Lab testing at 0.5C shows they achieve around 1000 cycles at 100% DOD (depth of discharge), 3000 cycles at 90% DOD, 5000 cycles at 80% DOD and 7000 cycles at 70% DOD. For a Volt 6 electric scooter discharged to 80% on each ride and riding at an average speed of 50 km/h (according to the battery manufacturer) the vehicle should do around 500,000 km. (This is lab testing so real world results will vary). This basically means that for most people doing around 10,000 km a year, they should be good for 20 years. New technology in batteries will be coming along quickly so current batteries can be swapped out with newer tech and then the old batteries can be used for energy storage in other applications such as home solar systems. We will store any unwanted Lithium batteries in our facility until there is a viable recycling facility in South Africa. Packing crates – The bikes are delivered in a crate that has cardboard and a steel frame. All of this is recyclable. Marketing materials – We try to use no single use marketing materials. Recently we had to succumb to producing business cards. However they do have pictures of the bikes, so are dual use, can be passed along and are recyclable. But that’s it! The rest of our info is distributed electronically via email, pdf and on the web site. We will also endeavour to ensure reusable items such as pop-up banners are completely recyclable. We use electronic communications email, pdf at all times to minimise printing. Where we are legally obligated we will print on FSC certified paper. Travel – We use the electric scooters nearly all the time for local journey’s and commuting. Where we need an ICE (Internal Combustion Engine) we are using bio diesel (Craig Waterman at Green Diesel) for some of the vehicles. Electric scooters are much cheaper to run because there is a lot less servicing needed. 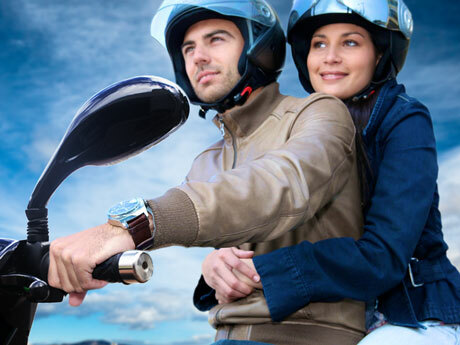 Our customer service team will manage your servicing and parts needs and we offer a low cost collect and return service if leaving your scooter with us is not convenient. Electric scooters have no belts, chains, pistons or gears to wear out and no filters, spark plugs or oils to change and no valves or clutches to adjust. EWIZZ electric scooters means great perfomance, lower running costs, long service intervals, super smooth and zero emissions. EWIZZ electric scooters typically need a rear tyre every 10,000, a front tyre at 20,000 km and brake pads every 30,000 km depending on how they have been driven, tyre and brake pad choice. The standard servicing is fixed price. As part of the servicing our technicians check all the important components of the bike such as brakes, suspension, steering, lights etc. The average range specified with each bike is what most riders will achieve with medium paced smooth riding. 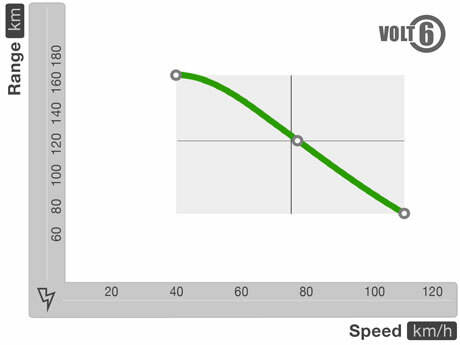 For example, Volt N80 has a real world range of 120 km with a mix of driving speeds at around 50-90 km/h. If driven faster at around 110 km/h it will be more like 80 km and if driven steadily at around 30-40 km/h it will me more like 160 km. In town there’s a lot of stoping and starting and the REGEN (regenerative braking) helps here. REGEN puts braking energy back in the batteries and saves on brake pad wear. Hard acceleration uses a lot of power, but the main thing that affects the range is high speed. This is because the effort required to push the air in front of the electric scooter out of the way gets much greater with speed. Simply put, the faster the rider goes the more battery energy is used in moving air out of the way and the less range that will be achieved. For the technical… aerodynamic drag is related to the square of the velocity difference between the air and the bike. Here’s a big difference between electric vehicles and internal combustion engine vehicles. Electrics are basically newer more efficient technology. They don’t waste energy creating lots of heat and noise, or have to overcome engine, gear and chain friction. Particularly at lower speeds, such as in traffic, they convert most of the energy used directly into motion. Electric vehicles are around 10 times more efficient at converting energy into motion than internal combustion vehicles. You can charge your electric scooter at any normal 15 Amp household plug point. It’s that easy, just plug in and let it fill. Being able to use household plug points means you need no special infrastructure and have around 50 Million places in South Africa to choose from. There’s also an increasing number or EWIZZ charge points and spots at cafe’s, restaurants, hotels and shopping malls, so keep an eye out for them. Normal charging times (from flat) are 4 to 8 hours depending on the charger and battery combination. The charging time is actually dependant on how much is left in the battery, or as we call it the “state of charge“, and the capability of the charger used. Most of the time the electric scooters won’t be empty, so the charging time is just how much extra you ned to put in, just like with a petrol tank. As an example, if there is 50% left in the batteries the charging time will be roughly 50% of the chargers rating, so 2.5 hours to fill for a 5 hour charger. You can see from the charging curves in the diagram how charge capacity builds with time. The EWIZZ on-board chargers are rated with an empty to full charge time. There are an increasing number of public charging points and points are springing up at cafe’s, restaurants, hotels and shopping malls. These are offered free by the establishments in a very similar model to how WiFi works. This is because it is very cheap to offer charging facilities to EWIZZ electric scooters and electric motorbikes. So with your electric you can travel around and recharge for free. Electric scooters take up so little room in parking compared to cars. Actually, you can get around 4 scooters in 1 parking bay. Finding a space to park is pretty easy and usually free. You often see scooters parked on the sidewalk and although this might get you a parking ticket. As long as they are not in the way of pedestrians, and other traffic, they are usually tolerated. Parking garages usually don’t charge for scooters and leave space at the side of the entry and exit barriers for scooters and bikes. There are a growing number of parking places that are also offering special parking places for electric vehicles with free charging. 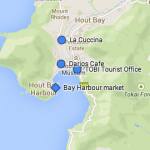 Check out our Charging points map. 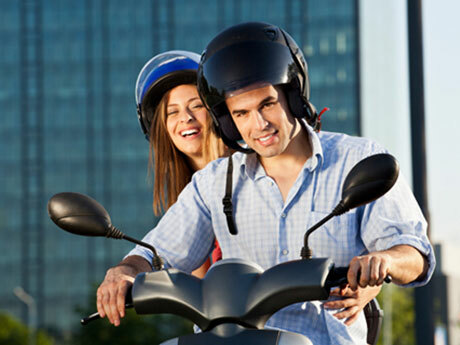 To ride an EWIZZ electric scooter or electric motorcycle you need at least a learners or A1 licence. This allows you to ride up to an equivalent of 125 cc. International visitors get special allowance, if they have a car licence, that gives them A1 status. If you do not have a licence then you need to go for K53 training. The K53 learners does not actually require any formal road training and is just a written test. There are a number of tricky questions on the K53 test so talking to an instructor really helps. We also highly recommend you take some road training tuition as there are some extra hazards when riding on two wheels rather than 4 and being surrounded by metal in a car. On a bike you’re open to the elements and if you hit something it really hurts. Training will guide you to avoid hazards. To make the whole process easier for you we can recommend a training team that can take you through all the K53 theory and practical, do advanced training and organise outrides for you to get experience with other riders.